Heavenly LED Ultra slim Gas station Canopy Fixture is an energy-efficient replacement for 250-400 watt metal halide fixtures, utilizing just120 watts. Built with a Heavy-Duty cast aluminum one-piece housing, these high quality LED Parking Garage Lighting Fixtures (also called a Canopy LED Lights or 1X1 LED Surface Mount Fixtures) are your solution where rust and/or corrosion proof outdoor LED lights are needed. This LED Gas station light fixture has a white polyester powder coating and is sealed to be dirt and bug free. 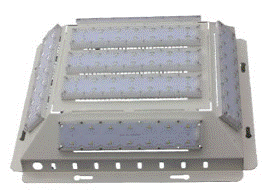 The high quality shockproof polycarbonate lens with UV inhibitors makes this LED fixture a long life option in applications where the fixture will be exposed to direct sunlight. The driver is a universal voltage 90-277. There are multiple knockouts for mounting convenience and is occupancy or Dusk-to-Dawn sensor capable.